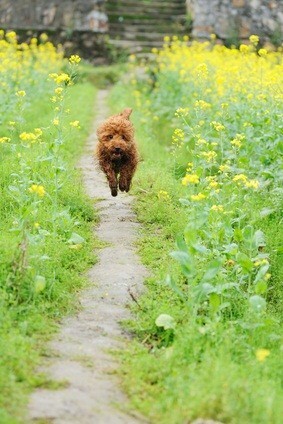 Finding time to exercise is extremely important as poodles need daily exercise, both indoors and outdoors. Walking is fine for all three sizes of poodles. You should be able to play with your pet indoors, and there needs to be enough room for her to run around. Make sure they can't run into anything indoors and get hurt. Poodles need to be walked daily (or more than once if there is no yard to use as a potty for them.) If you have a yard, be sure to play with them and let them run around. A daily walk is still recommended for all poodles, regardless of size, as this helps keep them trim and healthy. Finding time to exercise will keep your pooch from gaining extra pounds. An overweight dog can have joint problems, and obesity can lead to heart problems. Exercise outdoors gives your pet fresh air and helps to tire him out. A tired dog goes to sleep more easily and sleeps better and longer. Play dog games with your dog. Some poodles love to play fetch. Throw the ball and let them run, retrieve it and bring it back to you. Continue for a few rounds. You can teach your dog to play frisbee with you and have her run and catch and retrieve it then bring it back for more! That brings their natural hunting and retrieving instincts into play. I taught Holly how to play hide and seek. I'd throw an old glove as far as I could in our house, then run and hide. She was so smart, she'd catch the glove and throw it around a bit, giving me more time to hide! Instinctively, she knew I had had enough time and came looking for me! If she found me she'd race back to the glove, shake it a bit, then we'd start all over! 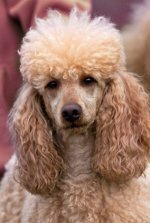 Poodles love to use their smarts, and an agility class will give them things to learn and do. The class will afford him lots of fun and exercise. Toy dog breeds are fine for walking around your block about 1/2 mile a day. They're smaller dogs with smaller legs so don't expect them to jog with you. 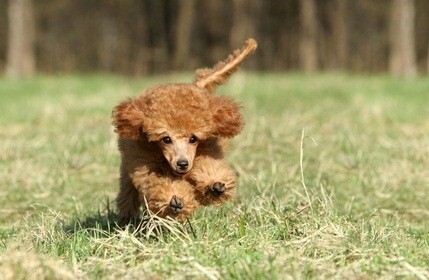 A mini poodle is a bit larger and should be walked about a mile every day. If she runs around the yard, or you play together in the house you can count this towards their daily exercise allotment. Standards are the biggest and need the most exercise. A standard can accompany you on your daily jog, just keep it reasonable to 2 miles a day. If your pet is overweight and you want to start exercising him, start out slowly. Start with a walk around your house or one round of fetch, then gradually increase it a little every 2 or 3 days. Pet feeding and exercise are two essential things your poodle needs daily. Exercise keeps him healthy and helps keep the unwanted pounds off. Finding time to exercise becomes easier once your pet looks forward to her walks.